You read it right! We’re moving. As if I don’t already have enough going on at the moment! A few months ago my husband and I found out the management property that owned the apartment we live in was selling the entire complex. We had the option of staying however, we would more than likely see a pretty big price increase if we did. We decided it would be best for our family to go ahead and move. There are currently four of us living in a two bedroom so it only made sense to make the leap to a bigger place. We shopped around for a few months and finally settled on a nice little three bedroom a few miles down the road from our current location. We will be able to keep the kids in the same school district and they will each have their own room. It’s a win/win! I’m pretty excited and little stressed. The kicker? We’re moving in a week. ha. HA! Honestly don’t know how im going to pack AND move while working 7 days a week. I was able to take one day off….that’s ONE day for the move. I’ve already started packing the non-essentinals and I’m planning on packing a box every night until we move. The way I see it, as long as I can get us into the new place and out of the old place, I dont mind living in boxes until I have time to unpack. Worse case scenerio (I love worst case!) we move and my internships end two weeks after. (Which equals more free time) So, worst case scenrio we’re in boxes for two more weeks. We can live like that cant we?! Well, at least we’ll have a bigger place. I’ve haven’t totally figured out how this is going to affect my training. Who thinks like that?! Most people: Oh, we’re moving? Lets decorate! No, lets paint! How will the new place effect my drive time to work? Will my energy bills go up? All I care about is how Im going to get my workouts in. Like when we were shopping for houses, I scoped out the back yards, porches, drive ways, and any outdoor open space I could fit my bike trainer in. I thought, “Maybe I could sit out here and bike while the kids play with the new neighbors?” In our apartment we had a lap pool that I could use in the warmer weather. I guess I have to get my own gym membership year round now! I also had an little gym with a treadmill at the old place; no more indoor running for me! At least not unless I want to invest in my own treadmill…nope! Too cheap for that! So this move will really change things for me. Since starting my marathon trainng I have had to get up twice a week and run in the early morning hours. First of all im NOT a morning person. Second, it’s way too dark at that hour to run outside. I guess I’m going to have to invest in night time running gear. Flashy light, reflective clothing, it’ll be a rave at 5am. Im at least happy that we aren’t moving far so I can keep most of my favorite training runs on the books. I just have to start from a different part of the planned route. Here’s a few pictures I was able to snap before we signed. 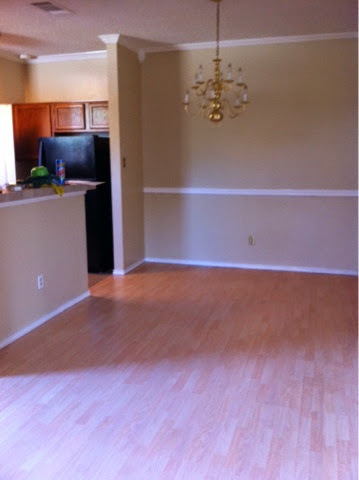 Master bedroom, hardwood flooring! Eeek! So pretty! Happy running friends! I’ll check in soon.